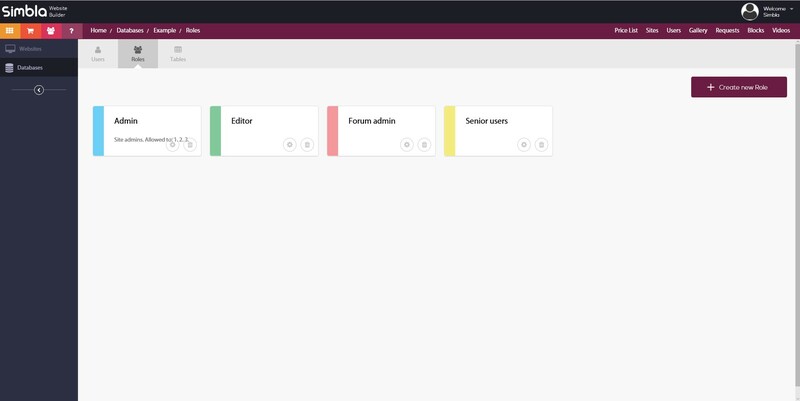 Simbla’s flexible role model allows you to grant different users or groups of users access to different parts of your website, apps and database. 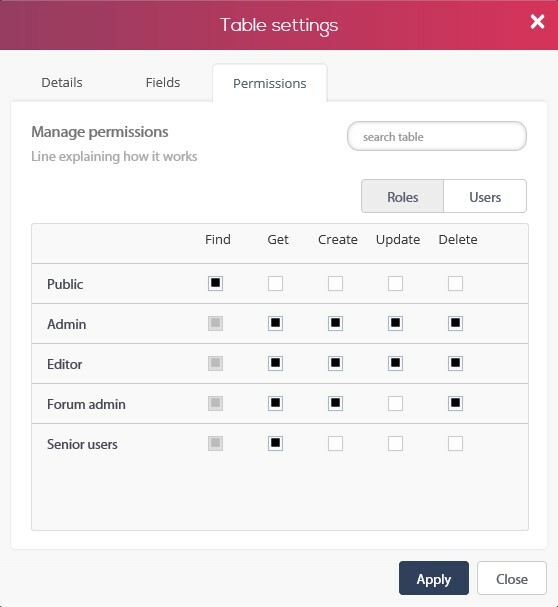 Roles allows you to create groups of users that will have different permissions applied on different tables. Find – searching for an object. Get - retrieve a record/object. Create – creating a new record/object. Update- update an existing record/object. Delete – delete an existing record/object. While setting up a role, you will be able to choose its permissions on an existing table and add all the users that you wish to include in the new role. 1. Role details - name and description. 2. Users- choose users to be members of the role. 3. Permissions - setup the permissions. 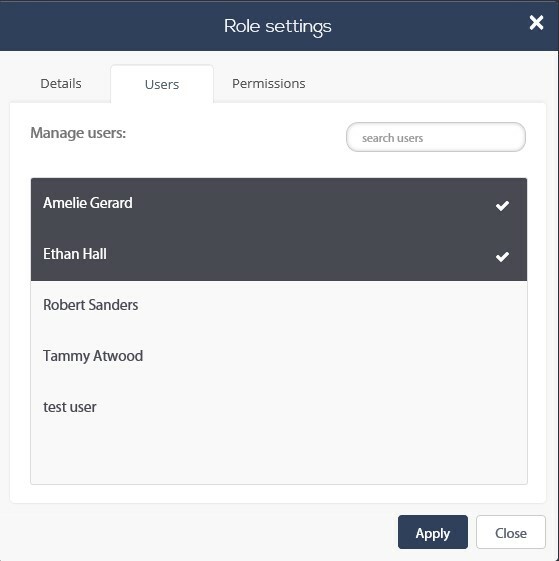 Please note that new users and roles are created by default without any permissions! 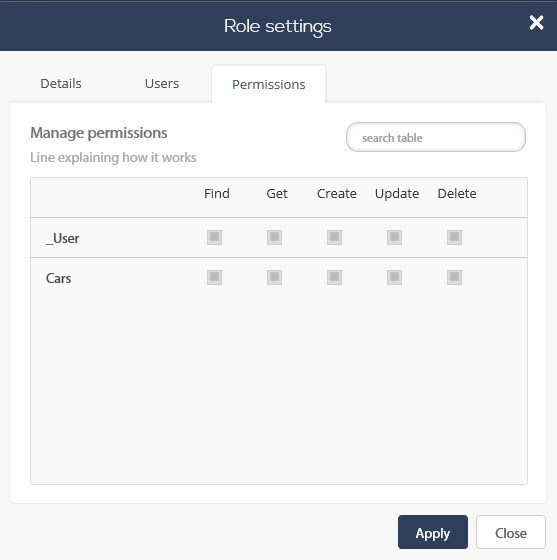 To create permissions with more specific rules, you can click the “Advanced Permission” button in the bottom left corner of your permission window. Note that there are a myriad of advanced permissions you can create in depth. We’ve chosen to show one simple example below, in which we will add a rule to our table that will allow only the user John to see roles created by John. Click “+ Add New Rule” in the top right corner of your window to add a new permission. Name your rule, and then define what you want to happen by clicking “Add Criteria.” This will open a new window that allows you to select the field name, criteria and value of the rule you’re creating. For instance, if you want to add a rule involving roles created by the user John, you can name your role “John_Only_Roles”. 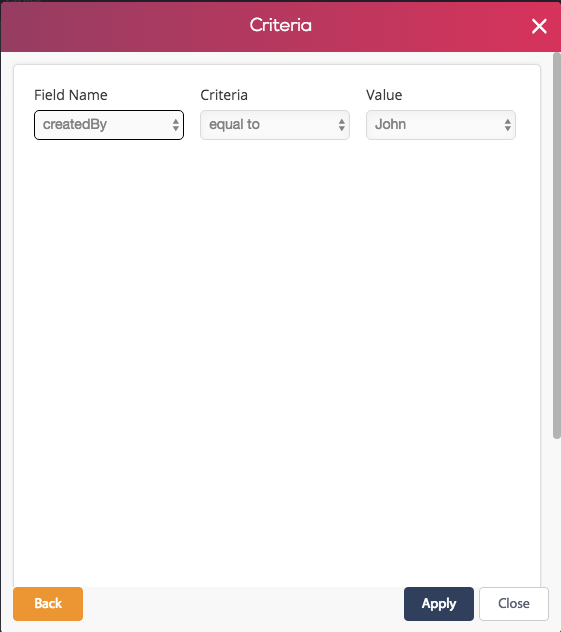 Click Add new criteria and choose the field “createdBy” under field name, set the criteria to “equal to”, and choose “John” as the value. This will take you back to the previous window, where you can define for which users or roles this rule is applicable. For example, say you want roles created by John to be visible only to John. Click on “Users” next to where it says “Permissions,” and then check off “Find” and “Get” only for the user John. If you want roles created by John to be visible to a specific role as well as to the user John, you can go into roles and define that too. 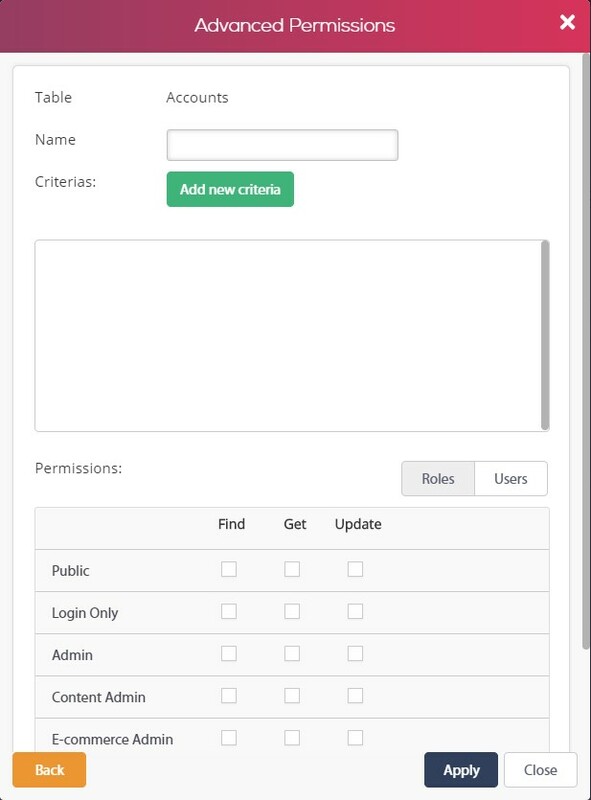 For example, if you want admins to be able to view roles created by John, you can click on Roles and check off “Find” and “Get” next to the “Admin” role, which will make your new permission applicable to admins as well. When you are finished, make sure to once again hit “Apply”. This will take you back into the original Advanced Permissions window, where you should now see your new rule listed. Don’t forget to hit “Apply” once again to complete adding your advanced permission. Note that you may go back and edit this rule at any time.